That’s a big ask of a writer. Our goal is to help you go from the first draft of your novel to a story that works and captures readers. Think about some of the best novels you’ve read. What do you remember? Like me, you probably recall a compelling character such as Jason Bourne, the intriguing plot of Gone Girl, or the fantastic settings depicted in The Game of Thrones. Compelling characters, an intriguing plot, or a fantastic setting make me remember the story. Successful writers tell a good story. Sounds simple, but telling a good story requires a great story edit. So you’ve finished the first draft of your novel. Congrats. Now what? Maybe you’re worried your writing isn’t good enough to share. Maybe you fear rejection or criticism. Or maybe you just don’t know how to edit your manuscript. Where to start? What to change? How to make it better? Editing and revising your novel is hard work. These are all thoughts that ran through my head a few years ago when I finished the first draft of my debut novel Descent. A story edit is the first step in turning your first draft into a story readers love. This comes before copyediting or proofreading. You can do that after the structure of your story is sound. Performing a story edit means analyzing your story from a high-level perspective and fixing the weak areas. During a story edit, take a hard look at your characters. How often do they appear? What are their goals? What gets in the way of their goals? Characters will drive the tension, and tension is what keeps a reader engaged in your story. Make sure the story structure makes sense, the scenes are tense, there are no plot holes, and your key scenes appear in the best place along your story arc. Finally, the story edit should examine your settings. How often do you use the same setting? Do your settings help with the tone of your scenes? Settings are key to keeping your reader engaged. I became a published author and hit Amazon’s bestseller lists by editing and rewriting until I was satisfied I was telling a good story that was ready to share. Along the way, I took all the best writing advice I could find and created a scene-by-scene self-editing technique focused on characters, plot, and settings. Then it hit me, perhaps other writers might benefit from this structured approach to editing their own work. So I spent a year working with dozens of other writers and a few very clever programmers to create Fictionary, a breakthrough online tool for editing fiction. 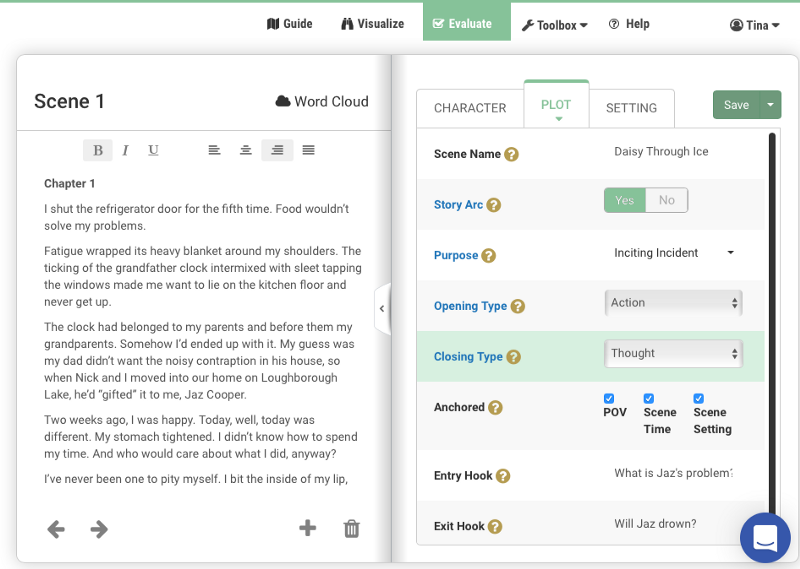 Fictionary provides a new way for writers to visualize, evaluate, edit, and finish a novel. Say goodbye to those old sticky notes or index cards you’ve been using to make sense of your story. Common manuscript problems such as scenes with no purpose, confusing points of view, or empty stages are quickly highlighted. You can “see” these problems and fix them during your rewrite. 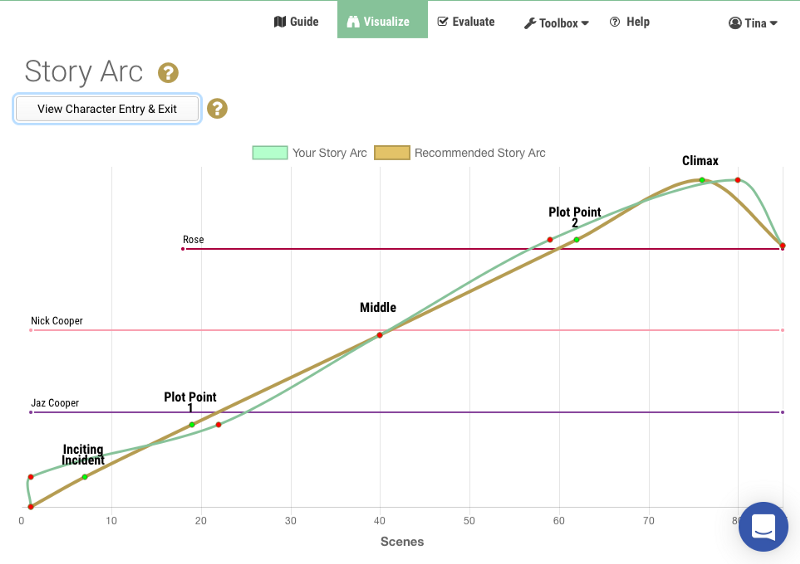 The Story Arc is an example report created automatically after you import your manuscript. No more trying to draw a story arc yourself. In today’s competitive publishing environment, you owe it to yourself to ensure your story works before sharing it with others. The Fictionary Finish Your Novel Contest. To encourage you to finish your novel and get published, we’ve partnered with FriesenPress and are hosting a contest together. One lifetime Fictionary subscription and a $1999 FriesenPress Publishing Package. $200 annual Fictionary subscription for 3 lucky writers! Check out the details and enter the contest. Winners are chosen at random. No purchase necessary.